Renata Tebaldi was an Italian soprano, who has been said to have possessed one of the most beautiful voices of the 20th century. Conductor Arturo Toscanini called her "voce d'angelo" (Voice of an Angel). 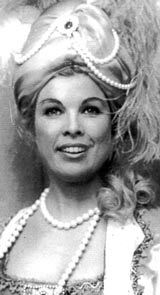 Tebaldi was trained and concentrated on roles of the late Verdi and Verismo eras, where only a minimal use of florid technique belonged to her repertoire. Dame Joan Sutherland was an Australian dramatic coloratura soprano noted for her contribution to the renaissance of the bel canto repertoire from the late 1950s through to the 1980s. She possessed a voice of great facility and power, combining extraordinary agility and a tremendous upper register. Her colleague Luciano Pavarotti once called Sutherland the "Voice of the Century".